Judge this book by its cover and you won’t hesitate to pick it up. Judge this book by its text alone and you might put it back down, but you should take another look. 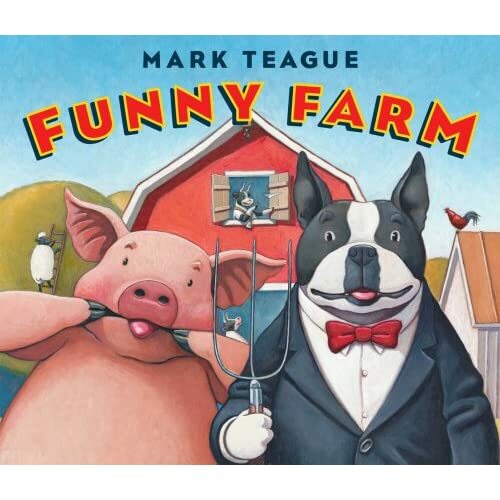 Mark Teague’s book, Funny Farm, appears to be quite ordinary at first read, but that would only be because you didn’t look closely at the pictures. Edward, a city dog, has come to visit his aunt, uncle, and cousin, for a springtime visit at their farm. Dressed in his suit — perfect farm attire — Edward pitches in to help with the chores. He manages to slip in mud while feeding the pigs. He is chased from the hen house after collecting eggs. Then, in good spirits, he finishes off his first day with a barnyard dance and a good night’s sleep. Using oil paints, award-winning author and illustrator Mark Teauge has created deliciously rich illustrations full of satirical humor that will have little ones in stitches. I mean, have you ever seen a sheep brush its teeth? Link: A review by Nerd Dads!